KARACHI, Sep 24 2012 (IPS) - The cost of doing business in Pakistan’s southern port city of Karachi is steep. Surviving the climate of impunity now requires more than bags of protection money – it also calls for a stoutness of heart. “Kidnapping for ransom and extortion have become the norm here, not an exception,” a 50-year-old factory owner in Karachi told IPS. He considers himself lucky that he pays a “protection” bribe of 50,000 rupees (528 dollars) every month when others around him are forced to pay much more. The extortionists, locally called the ‘bhatta mafia’, are often young men between 18 and 30 years old, wielding state of the art ammunition. They have the support of four major political parties – the ruling Pakistan People’s Party, the Awami National Party, the Muttahida Quami Movement (MQM) and the Haqiqi. Recently, the Taliban have also been demanding a slice of the Karachi extortion pie. The bhatta epidemic started about three years ago, according to Anjum Nisar, former president of the Karachi Chamber of Commerce and Industries. Nisar told IPS that the problem was initially concentrated in a few of Karachi’s industrialised zones like Korangi and SITE, but has now engulfed the whole city including shopping areas and marketplaces and become “quite uncontrollable”. Not only factory owners and big industrialists but also small shopkeepers are at the mercy of blackmailers. There are three or four ways employed to extort money, shopkeepers located in the city’s wholesale market for automobile spare parts told IPS. The fear factor is so intense that most were even afraid to speak, let alone identify themselves on the record. “It starts with one phone call where they demand a ridiculous amount. Then they give you information about where your kids study and their regular haunts. If you resist, you will either get shots fired on your shutters or a brand new bullet sent to you along with a note saying, “this will be used either on one of your employees or even you”,” explained one of the shopkeepers on condition of anonymity. Those gathered around nodded in silent agreement. 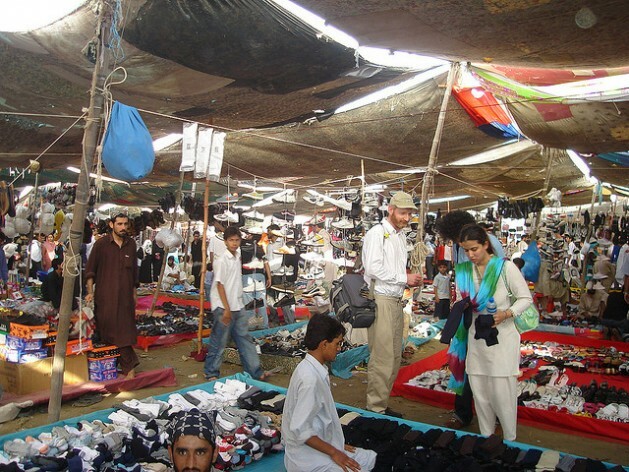 “Because you know these threats are real, you negotiate and come to a mutually agreed amount,” a white-haired store owner on Tariq Road, one of the most popular market places in Karachi and home to over 2,000 shops, multi-storey plazas, showrooms and offices, told IPS. “(The bribers) have got guts, they even leave messages on your cell phone; if you go to the police to trace the number, the latter usually tell you to pay up,” he added incredulously. “And it’s not just the police, who are under-resourced anyway; even ministers or members of parliament, many of whom are known to us on a personal level, tell us it is best to settle,” interrupted his neighbour, adding that the “extortion epidemic” is now beyond anyone’s control. Shopkeepers at the Plaza, the biggest auto spare parts marketplace in the city, say they pay anywhere from 5,000 to 10,000 rupees (roughly 50 to 100 dollars) annually to each gang. There are over half a dozen gangs, all of whom operate under the umbrella of some political party or another. “There are also random telephone calls ordering us to whip up anywhere between 200,000 to 500,000 rupees (2,000 to 5,000 dollars) within a few days’ notice,” a business owner at the Plaza told IPS. Several others told IPS the mafia has devised a myriad ways to extort money. “They kidnap you, make you call your family from your phone and ask them to arrange for a certain sum of money in two hours. These are speedy kidnappings and you are released within a few hours,” said a bearded man who appeared to be in his late fifties. He refused to be identified, saying it was too dangerous. “These young men are very clever and may just come to me with this article asking why I dared to speak,” he explained. According to Nisar, massive unemployment could be a factor. “About three million people entering the job market each year are unable to find employment,” he said. Karachi, a sprawling city of 18 million, is the country’s economic hub, accounting for 95 percent of Pakistan’s foreign trade and contributing 30 percent of national industrial production. “Pakistan is losing between 1.3 and two percent of gross domestic product (GDP) annually due to the energy crises and an ineffective law and order apparatus,” said Nisar, citing financial ministry statistics. “A tax base of less than 9.5 percent, coupled with the highest interest rate for the private sector in the region (roughly 13 to 14 percent), has ruined the investment climate completely,” he lamented. Now, extortionists are sapping the city’s economic potential even further. Compared to the economic performances of other countries in the region, the impact of lawlessness on Pakistan’s economy is startling. “In 2002 Vietnam’s exports totalled two billion dollars; by 2012 that had increased to 80 billion dollars. South Korea was way behind us in 1965 and they used our economic model. Look at them now — their exports have reached 550 billion dollars. India’s exports are worth 300 billion dollars. We’re so well endowed both with natural as well as human resources and yet our exports amount to less than 24 billion dollars,” Nisar pointed out. He also suggested the imposition of a night curfew. “This will act as a deterrent, as many lootings take place in the night,” he told IPS. Until those measures are implemented, “we have demanded that the government give us licences to keep weapons,” Nisar said. At a recent meeting called by the chief minister of the Sindh province, Syed Qaim Ali Shah, the inspector general of police and officials of intelligence agencies briefed local politicians and businessmen on the law and order situation and claimed they were not even equipped to trace the phone calls made by blackmailers. But residents and victims of the wave of extortion are not convinced. “I cannot believe the government machinery cannot deal with this plague, which is going on right under their noses. If our intelligence agencies can dig up and hand over hard-core militants, surely these criminals, who are very visible, can be easily caught?” a shopkeeper on Tariq Road exclaimed.